home - blog - Linen Gift Ideas, LinenMe Shop News, Table Linen - New Arrivals. Lara Table Linen of Gorgeous Colours and Extreme Softness! New Arrivals. Lara Table Linen of Gorgeous Colours and Extreme Softness! 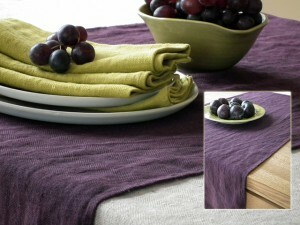 Autumn fruits of our labor are these gorgeous table linen items of extreme softness. Citrine, cream, dusky lilac, lake blue – these are the color names of new napkins, runners and tablecloths of new Lara table linen collection. Not only names are beautiful – check by yourself! The distinctive feature of the collection is extreme softness of the fabric. This has been made possible due to garment wash technology, which makes the fabric shrink and reveals natural softness of linen. All the items will shrink no more after you wash them. Machine washing and machine drying with moderate temperatures is possible for all linen items, so use your appliances with no hesitation. Our advice is to iron items while still damp, though ironing is not really a preference with Lara table linen. 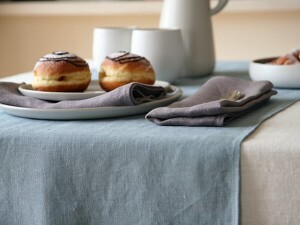 As they are soft, natural wrinkles only add character to a napkin or a runner and a table looks more lively and cozy. Putting together a color palette is the most rewarding and fun activity both for us, textile designers, and for you, your home designers. We browse through millions of colors and shades and pick those that can add to making your home a cozier place with a style and those that can help you express your character and tastes. And then we hand over our entire product to you – it is your turn to pick and choose the items and colors you like to see in your private territory. This time we are happy to present you the results of our efforts. The colors you will find here can make your table look classic, trendy, stylish, jolly or peaceful. And every time it will look elegant and show the way you perceive beauty and coziness. So, go ahead and make you dining area different!